Country Tweed for the City…. Cut: Slim, Single Breasted, with double breasted waistcoat. Occasion: City to country to weddings! Notes: This stylish young gentleman, who divides his time between the Cotswolds and London needed a lightweight tweed from Holland & Sherry which would work well in both environments. This suit is all about versatility and juxtaposing the city with the country. The suit offers a contemporary cut double breasted waistcoat. Price: Contact Henry Herbert Tailors. 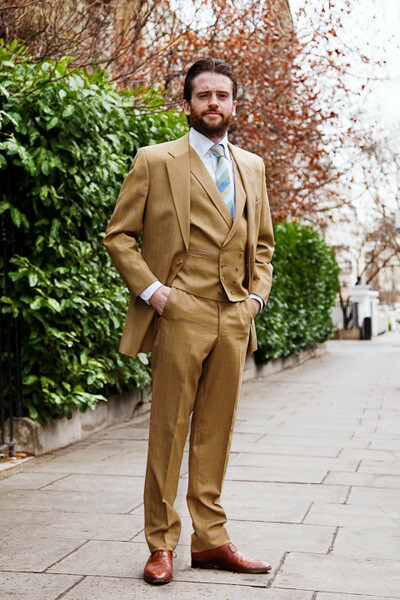 See also: 3 piece suits for men, 3 piece tweed suit, breasted waistcoat, brown tweed suit, City, Cotswolds, Edinburgh, edinburgh scotland, fabric, fabric source, Henry Herbert Tailors, Henry Herbert Towers, Huddersfield, London, london suits, mens 3 piece tweed suit, mens suit, mens suit london, mens tailors, mens tweed suit, mens tweed suits, mens tweed suits uk, modern tweed suit, Scotland, single breasted, suits london, suits uk, tailored tweed suit, Tweed, tweed jacket, tweed jackets, tweed suit, tweed suit jacket, tweed suit london, tweed suit men, tweed suits, tweed suits for men, tweed suits london, tweed tailor made suits, tweed wedding suit. modern tweed suit Archives - Bespoke Suits By Savile Row Tailors.